The COUGAR SPIKE case is a mini tower but is designed to accept longer high-end gaming graphics cards thanks to the 330mm of clearance. Indeed, the list of functionality of micro ATX motherboards is growing and becoming more complete. Many system builders feel that ATX motherboards can be replaced by micro ATX motherboards nowadays. • The SPIKE delivers availability and expansion capability in a space-saving design to fully complete the gaming mission! • Advanced USB3.0 port for maximum data transfer speed. • Support for 4 fans: front 80/90/120mm fan x 1; rear 80/120mm fan x 1 ; side 120mm fans x 2. 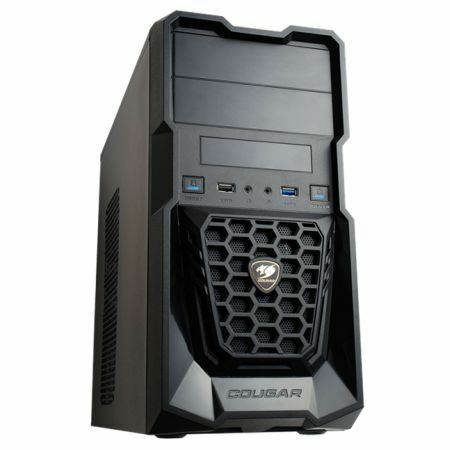 • Rear COUGAR 120mm fan x 1 is pre-installed. • Support for longer high-end graphics card up to 330mm. • Screw-less mechanisms on 5.25” & HDD devices. • Support installing 2.5” HDD/SSD at bottom cover.